Hi! We’re glad you’ve taken the time to check out Island Bible Chapel. You can learn more about us in our Welcome Brochure (IBC Brochure), or you can keep reading below to learn about our services on Sunday, our leadership, our history, our purpose and what we believe. We hope to get to know you better. -10:00 a.m. – The Lord’s Supper (ie. Breaking of Bread/Communion). Our style is relaxed as we combine an appreciation of older hymns with upbeat, contemporary choruses and worship songs followed by teaching. It is a great opportunity to learn together from God’s Word! Our church family is led by a team of Elders and Deacons. Most of our teaching, counseling, major decision-making and pastoral care is looked after by our Elders, while the Deacons are responsible for most financial, building, and specific program decisions. One of our elders, Bryan Windle, has been “commissioned” to work full-time with our church in a “pastoral” role. Island Bible Chapel (IBC) began as Bible study in the homes of local believers on St. Joseph Island from 1973-75. In 1976, the group decided to officially form a church, and in September, less than 20 people came for the first church service, held at St. Joseph Island Central School. From these humble beginnings, the Lord has worked in amazing ways. The church grew quickly, both numerically and spiritually, and in 1977 property was purchased and construction of the Island Bible Chapel began shortly thereafter. The inaugural service in the new building was held on June 1, 1980. For more than 30 years, IBC has been shining the light of Jesus on St. Joseph Island and in the Central Algoma region. 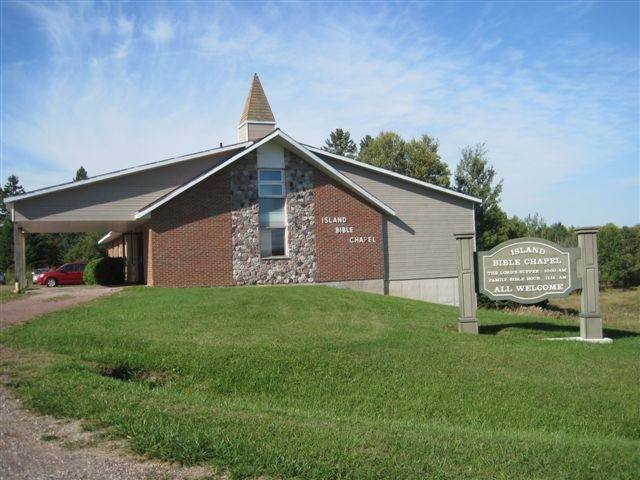 Island Bible Chapel is an independent, evangelical, Christian (Brethren) church. Worship the Triune God – Although we believe that a Christian’s entire life expresses what he or she thinks about God, we will make it a priority to corporately express our appreciation and respect for our Lord. By sharing the Lord’s Supper, singing, praying, and declaring our love and admiration for the Lord we will consistently focus our attention on Him, which is at the heart of worship. We also want to be clear that we worship the one God who has existed eternally in the form of three persons – Father, Son and Holy Spirit. Introduce Jesus Christ to our world – Jesus’ Great Commission to His followers was to spread the Gospel throughout the world. We will do our best to communicate the good news about Jesus to people locally (evangelism) and in the more distant parts of the world (missions). Of course, we will do this with love and respect for others, whether they choose to follow Christ or not. Nurture our fellow believers – On the last night before His death Jesus prayed that His followers would experience unity and pronounced that disciples of His would be identified by their love for one another. We want to honour the Lord and all other members of His kingdom by caring for one another with love and humility. Befriending each other is important so that we learn to be the family of God. Nurturing not only includes loving support but encouraging each other to love God and live for Him. We are committed to teaching, training, discipling and challenging each other to grow spiritually, mature in the faith, and develop godly character. We believe that the Bible, consisting of both the Old and New Testament, is the inspired Word of God, without error in the original writings. It is the complete revelation of His will for the salvation of man and is the final authority for Christian faith and life. We believe in one God, the Creator of all things, infinitely perfect in all His attributes. He exists eternally in the form of three persons, namely the Father, the Son and the Holy Spirit. We believe that Jesus Christ, the Son of God, is fully God and fully human, having been conceived by the Holy Spirit and born to the Virgin Mary. He died on the cross as the sinless sacrifice for our sins, according to the Scriptures. He rose bodily from the dead and ascended into heaven where He currently intercedes for us at the right hand of the Majesty on high. We believe that the ministry of the Holy Spirit during this age is to promote the Lord Jesus Christ, to convict men of sin and to indwell, guide, instruct and empower the believer for godly living and service. He is the “deposit” guaranteeing our life in the future kingdom. The Spirit baptizes individuals into God’s family, fills believers and produces Christ-like fruit and character in committed believers. He provides spiritual gifts to all believers that enable them to effectively serve God and one another. We believe that man was created in the image of God, both male and female, but that Adam and Eve sinned, resulting in spiritual death and becoming subject to physical death. We believe that their sin brought sin and death to all future generations and made them subject to God’s judgment. We believe that salvation from God’s judgment is by faith alone in Jesus Christ, the only begotten Son of God who died for our sins and rose again from the dead. One cannot be saved by works, which instead are evidence that one has been truly saved. Those who are saved are born again and are eternally secure in Christ. We believe that all people in the world who truly believe in the Lord Jesus Christ are members of the “universal” church and became members at the moment when they believed. The regular gatherings of believers in any particular locality make up what is called the “local” church or assembly. These assemblies have the right to govern themselves independently and are ultimately accountable to Jesus Christ. We believe that baptism and the Lord’s Supper are ordinances to be observed by the local church during this present age. They are not to be viewed as a means of salvation, but are carried out in obedience to the commands of the Lord Jesus Christ. We believe in the personal, imminent and pre-millennial coming of Jesus Christ and that this “blessed hope” has a vital bearing on the personal life and service of the believer.